A good reason to be spooked: Manga great Shigeru Mizuki has died. He was most famous for his GeGeGe no Kitaro series of horror/fantasy stories, but as of late he got acclaim in the West for his remarkable cycle of books about Japan in WWII (Onward Towards Our Noble Deaths; the Showa: A History of Japan books). All come highly recommended. It's a shame the work of most greats only tends to become more broadly appreciated outside of their immediate circles only after their death; Mizuki was far luckier than most, garnering an Eisner just recently. Budget and time permitting, his work is a great example of the kind of manga I'd like to examine here. 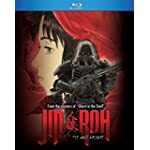 Crunchywolf: Jin-Roh: The Wolf Brigade, the best Mamoru Oshii film that Oshii never directed (he wrote it, though), is now on Crunchyroll and comes highly recomended. Two on the live action tip: Live-action anime news coming faster than ever here. First off, release dates for the live-action adaptations, plural, of Chihayafuru. The other is an adaptation of the zombie-killin' extravaganza I Am A Hero. Look for the U.S. release of that next year thanks to Dark Horse, when people will make the inevitable comparisons to The Walking Dead. Punch this! : The original creator of One Punch Man is getting an earlier production of his, Mob Psycho 1000 (what a title) also adapted into an anime. C-roll sez it's about "a psychic 8th-grader who tries to stay unnoticed and unexcited to avoid causing problems with his powers." It's always the quiet ones you want to look out for.